The electricity sector remains the brightest spot for renewables with the exponential growth of solar photovoltaics and wind in recent years, and building on the significant contribution of hydropower generation. But, electricity accounts for only a fifth of global energy consumption, and the role of renewables in the transportation and heating sectors remains critical to the energy transition. This is why Renewables 2018, the annual IEA market analysis and forecast on renewable energy, takes an in-depth look at bioenergy, the largest source of renewable energy globally. Often overlooked, the contribution of sustainable bioenergy represents a “blind spot” in the global debate about renewables. 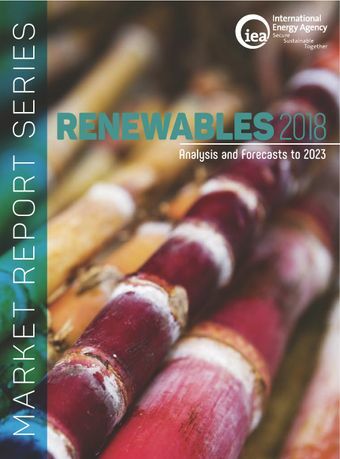 Bioenergy makes a significant contribution across the energy system, particularly in the heat and transport sectors.In addition to looking at renewable energy across the entire energy system, Renewables 2018 provides a detailed market analysis and overview of renewables in the electricity, heat and transport sectors as well as forecasts for the period between 2018 and 2023. The report also highlights policy and market improvements that can unlock further growth of renewable energy in electricity and transport biofuels, as well as underlines the untapped potential of sustainable bioenergy and other renewable sources in greening the industry and transport sectors. For the first time, Renewables 2018 also includes a chapter dedicated to answering some of the key questions raised by the latest developments in renewable energy markets.